I spent some time at home over the Easter break, and with nothing better to do of a Good Friday morning, decided to head out Westport direction to climb Croagh Patrick. Unfortunately, as I ascended the Reek the weather took quite a dark turn, with an ominous and somewhat strange cloud cover quickly closing in as I reached the summit. Visibility was reduced to zero in this eerie weather front; a dense fog hanging in the air. I had lost track of time as I wandered blindly in a vain attempt to retrace my steps, when all of a sudden, there was a parting in the gloom and a single shaft of light pierced through to illuminate a cavernous tent in front of me, not unlike a circus big top. In front of the entrance, a small, wiry man looking out over his spectacles sat cross-legged on the ground. As I approached him, I discovered it was none other than Joe Brolly, bedecked in full ring master’s garb with top hat and tails. “You’ll never guess who’s hiding in here…” he winked at me, motioning behind the curtain. In a trance, I stepped behind the drapes and into the hall to discover the rear of the tent – or marquee as I had come to discover it – was open to the elements and facing out to the Atlantic, now bathed in glorious sunshine. But what took my attention wasn’t the scenery, the tent or the ringmaster. It was the hulking colossus in the centre ring – an 8 feet tall heavyweight, Fionn MacCumhaill in Puma Kings, kicking size five O’Neill’s footballs clean out to Clare Island. I realised then who stood before me. The mythical marquee forward…. Of course none of the above happened. It’s a figment of my imagination. Pure fiction. And yet the above seems less of a fairytale than some of the GAA punditry attempts over these past few months, and it’s not just Joe Brolly that’s the ringleader. Stick the words “Mayo Marquee Forward” into Google and you will discover 342,000 separate entries and I would wager most if not all of those articles can be boiled down to one single, broad generalisation. And that would be the lazy assumption that if Mayo had a MARQUEE FORWARD® then they would have won at least one of their recent All Ireland final appearances. Let’s not take for granted that there have been three of those finals in the past five years by the way. In all, Mayo have played four finals in that period and lost them by a combined total of six points, which includes the last two by the bare minimum to arguably the greatest team of their generation. Not to mention a draw. So the fact they have been so close begs the question – if all Mayo need is one single individual to make the difference and get them across the line, what does every other county need? The usual clichés are bandied about far too easily when this debate crops up. Names thrown about like confetti. Michael Murphy. Diarmuid Connolly. Colm Cooper. Peter Canavan. Stephen McDonnell. But of course what separates all of the aforementioned from say, Cillian O’Connor is the fact they are proud owners of a Celtic Cross. Winning hides a multitude of failings, and Canavan himself spoke eloquently on this topic in the past fortnight. Without the titles to match the talent, the Tyrone man would have been just another fine footballer instead of “Peter the Great”. Neutrals I speak to recall Cillian’s miss in the lost final against Dublin last year. Those of us of a Green and Red persuasion remember his superhuman effort both that day and in the first match; in particular his equalising score from 40 yards to salvage the draw. Such are the fine lines at the elite level. But it’s also worth remembering that for all the (deserved) hype and praise for footballers such as Murphy, the footballer of the year from Donegal’s 2012 success was Karl Lacey. Similarly Jack McCaffrey in 2015 rather than Connolly. Or indeed Lee Keegan last year. Ahem. To claim Mayo lack MARQUEE FORWARD® is just too simplistic. I refuse to believe there is another team in the country that wouldn’t welcome either O’Connor brother into their side with open arms for example. What is arguably more critical in delivering success is a MARQUEE MANAGER ®. Someone who can take the parts at his disposal and make them greater than their sum. Unlocking potential that players, pundits or fans never knew was there. Reinventing and refreshing the collective. The great managers and players look to invention and reinvention for success, never resting on what worked in the past. Liverpool’s “boot room” evolution from Shankly to Paisley to Fagan to Dalglish. Sir Alex Ferguson’s continuous rebuilding of sides at Manchester United. Muhammad Ali changing his style to the short term success but long term tragedy of his “rope-a-dope” later years. Brian O’Driscoll sacrificing flair for even greater defensive leadership in the latter part of his career. Cristiano Ronaldo demonstrated a more recent example in the knock out stages of this year’s Champions League, showing he had evolved from skinny skilful winger at Manchester United, to Real Madrid powerhouse forward, and now goal poacher extraordinaire in his twilight years. And there’s precedence in Mayo too, with Ciaran MacDonald’s transition from a young, mercurial “shoot on sight” forward to the passing, creative lynchpin he eventually became driving Crossmolina to All-Ireland success. The reality is that there is no hidden talent in the County that can simply walk into this current Mayo team and deliver an All-Ireland title. But conversely, it can’t be derived that one such individual determines success or failure. In the modern game, where the line between half forwards and half backs become blurred, a creative defensive player can deliver match-winning scores in the same way that hard-tackling, hard-running forwards can stymie a creative attack. Single-point losses to a superb Dublin side in two of the three recent finals is testament that this crop of Mayo players possess the collective to get very close to the line and it doesn’t – indeed couldn’t – simply hinge on the addition of a single individual to cross that line. The creative challenge isn’t for a one-off new talent – it’s for the management and players that are already in-situ. A bit of invention against the auld enemy on Sunday would be a good place to start. The bros O’Sé are among two of the best analysts of Gaelic Games at the moment. Darragh’s weekly column in the Irish Times is always worth considering, and ditto Tomás’ inputs either on TV or in print media. There’s inevitably an element of cute hoorism and divilment with some of their views where the Kingdom are concerned, and indeed you could actually see the smirk on Tomás’ face when he stated things were “laid out” for Mayo on Sunday night. But by and large anything they have to say is usually measured, interesting and free from hyperbole. That they played the game to the highest level of distinction in the modern game gives their views further credence and also provides the odd glimpse under the bonnet at the inner workings of the senior inter-county machine. Tomás was fairly forthright in his views on Mayo over the past few weeks, both in his Irish Independent column the weekend before last as well as in his summary remarks on the Sunday Game in the aftermath of the Kildare victory. In essence he felt there was a big performance in this Mayo side, but they needed to demand more of themselves to deliver it and not simply expect things to click into place. This was further backed in Darragh’s column in the Irish Times on Tuesday of the run-up to the Tyrone game. Difficult to argue with the general sentiment, and by and large their thoughts were validated in last Saturday’s gutsy win. However, over the course of the qualifying run and particularly when trying to consider what went right tactically in Croker this weekend, the article that I continued to return to was one written by Darragh back in May. In it, he tactically disassembled the component parts of a prototype team for success in modern Gaelic football and I found it an interesting structure to test the current Mayo team against, and perhaps try to understand some of the logic in Rochford’s tactical set-up. Pace. Athleticism. Physicality. These provide the bedrock for any top-level team and for the past five years Mayo would have defined this template. However, at various points this season there has been a lethargy and almost sluggishness for large tracts of their performances. This could be a new approach to conditioning, with the aim to peak in late rather than early Summer. It could be the effect of a more contained possession-oriented game plan limiting the opportunities to showcase these physical attributes. Or it could also be the mileage of the past few years taking a toll on collective limbs. Mayo’s aim has always been to arrive at full tilt in August and in beating Tyrone a lot of these questions were answered. Tipperary will undoubtedly provide a further test of those credentials however. Solidity is simply taken for granted in the view of the man from An Gaeltacht. Not so much on direct shot-stopping, but ability to provide a calming presence and command a defensive structure. It’s in distribution where O’Sé sees the critical and defining factor for top-level teams. After Rob Hennelly’s sub-par showing against Galway and following a couple of smart saves in the subsequent games by his replacement, David Clarke would seem to have the edge when it comes to defensive assurance. He was particularly alert in those hectic closing moments against Tyrone to an undercooked cross-field pass. However a clearly defined and well-executed kick-out strategy still seems to be a challenge. 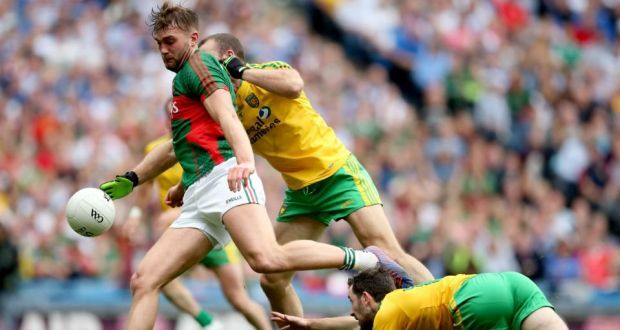 A focus has undoubtedly been on short kick-outs, but this has often been to the detriment of Mayo’s other attributes namely height and presence in the midfield and centre-forward axis. A recurrence to kick short towards the left corner back position (invariably with Diarmuid O’Connor dropping deep to collect) has been somewhat predictable, and is an avenue open to pressure leaving an exposed inside 21 metre area. Tyrone picked off a point from an error with this strategy, while Galway capitalised on an intercept to major and only Westmeath profligacy prevented a similar mistake. Regardless of the strategy, improvements will need to be seen in the communication and execution, especially against a hard-working Premier side that will likely press from the front in addition to competing strongly around the middle third. This would certainly explain why Kevin Keane has appeared in midfield territory almost as regularly as the full-back line in recent games, tracking runners into more advanced positions and perhaps furthermore explain why he was the man who lost out in the last positional reshuffle. Brendan Harrison would appear to be the dedicated marker, still effectively functioning as an orthodox corner back but on Saturday taking up a more central role. Kevin McLoughlin clearly seems to be the appointed person to drop and patrol, and he has certainly made some crucial interceptions. However, for someone to effectively guard this area, I can’t help feel that height or at least a more experienced defender would be a more effective use of the position and free up McLoughlin to operate further forward where he has done his best work. Peter Canavan did an excellent assessment of this prior to the Kildare game where he didn’t really fault the tactical design, but was critical in the communication and execution. McLoughlin has shown enough through the qualifiers to suggest he’s learning on the job and getting to grips with the role and further improved on Saturday, but he has always been a quietly effective performer and has one wonders if a more vocal presence is required to marshal the defensive pieces, similar perhaps to Ciaran Kilkenny’s role for Dublin last weekend. It may be too simplistic to simply state Higgins should slot in here, but certainly the collective alertness and positioning of the full defensive unit needed to improve, and there were encouraging signs of protecting this “D” area on Saturday, which can be addressed further when considering Darragh’s second observation. “There are five or six across the 45, numbers irrelevant. There are no wing backs or wing forwards, just wingers”. Arguably this should be one of Mayo’s core strengths. Vaughan, Boyle, Keegan, Higgins, Durcan are all capable of effectively operating in this position – holding a defensive line, forcing turnovers and breaking at pace. Dublin, Tyrone and Kerry are experts at coordinating this effectively to push “up and out”; forcing advancing attackers to recycle deep or laterally, eventually resulting in long-range or wide-angle efforts at the posts. To try to put some clarity on this concept of the “D” , let’s consider the central area to approximately 25 metres out as a “Hot Zone”, or area where scores are generally easier to come by as illustrated in the image below. The area beyond 35 metres (or also arguably down the channels out wide) can therefore be the “Cold Zone” by default, as it would indicate players are not only kicking from further out but have been forced to shoot from such a position and are therefore possibly under more pressure. If the sweeper system functions effectively, it should be a point of strength to have an inside cover-man protecting this “Hot Zone”, with a quick and aggressive barrier in front preventing strike runners from punching through. The introduction of Doherty and Dillon to further swell numbers in this area against Tyrone was clearly an attempt to reinforce the barricades and there was a tangible improvement in delivering on this as can be illustrated by pinching some statistics from the excellent Don’t Foul. Take the performance against Galway as a benchmark (or nadir), of Mayo’s defensive coordination this year. This game was the first test in anger of this new defensive system and Mayo conceded 25 shots from 33 attacks. While this was less than 33 conceded against Tyrone (from 45 attacks), let’s look at where those were taken from as per the table below. First of all, it’s worth noting that the conversion of scoring opportunities from attacks stayed broadly level around the 77% – 78% mark in both games. However, look at the breakdown of where they were conceded. The decrease of scoring chances in the hot zone, and increase of same in the cold zone could indicate a clear strategy to force out, wide and frustrate the through-runners. Put simply, Tyrone got their hands on more ball than Galway but were forced to use it in a sub-optimal fashion. There has rightly been criticism of Tyrone’s shooting, but it’s arguable that the Mayo defensive structure was a major factor. Setting aside the last few minutes of the first half and the entire second half against Westmeath, Mayo have conceded 32 points over 205 minutes of football. An extremely meagre tally which would have indicated progression and an understanding of how to implement Rochford’s system. However, of course we unfortunately can’t ignore that performance against the Lake county where the defensive system’s fragility was clearly illustrated in the concession of James Dolan’s goal against the run of play just a minute before half time, ultimately setting the tone for an extremely lax showing in the latter 35 minutes. As illustrated in the image above, only 4% of scoring chances in the hot zone against Tyrone were from play which would indicate a learning to accept the tactical foul rather than risk a direct run on goal and the possible concession of goals similar to the ones against Galway and Westmeath. The pieces appear to be there, but the collective concentration and communication will need to be maintained to the highest possible level for 70-plus minutes. Probably a fair summation of how the game is evolving, however a team with the aerial ability of Parsons, Moran and the O’Sheas should be attempting to harness this as a strength in securing primary possession rather than contesting second ball. In either case, the transition from defensive 45 to attacking 45 is becoming more and more critical and the lines between centre-half back, midfield and centre-half forward are ever more blurred. Put simply, a physical and hard-running performance will be the minimal requirement from whoever plays at 8 and 9, but effective passing and an ability to create space will be critical. The wayward passes into the forward line versus Westmeath and continuous carrying of possession into the tackle simply cannot be repeated. For all his attributes, skill and agility, this link is simply not Aidan O’Shea and the big Breaffy man has looked lost at times this season, bereft of a settled position. In an interview this week with Colm Parkinson on the sportsjoe.ie podcast, he alluded to personal issues affecting his form, however the lack of a clearly defined role was undoubtedly also playing a part, even ending up in the unfamiliar terrain of full back against Fermanagh. On Saturday however, aside from a ten to fifteen minute spell in the second half where the supply lines into him were labouring, O’Shea was back to his marauding best – commanding possession, full of industry, and cleverly switching between midfield and the edge of the square to bring runners into the game. Landing a beautiful long-range score himself simply capped a very welcome display, and it becomes clear that these are the two locations in which he needs to be stationed. In reality it’s difficult to see how this concept of one key player (perhaps the legendary “Marquee Forward”?!) translates into the Mayo style of play as the half forward line has typically been based on hard-working, deep-carrying, breaking-ball winners in the mould of McLoughlin, Doherty, and Diarmuid O’Connor. However, Alan Dillon’s introduction against Fermanagh clearly illustrated the importance of a calm and clever playmaker along the 45 metre line. It was physically impossible to expect a full seventy minutes from the Ballintubber man against Tyrone, but his subtly different yet similarly effective first half cameo was hugely important. If anyone is to fill this role from the start then it should probably be his clubmate Cillian O’Connor, who has the guile to play inside passes and illustrated how comfortable he can be at long-range point taking which is always useful in the face of a compact defence. However, taking a scoring forward out of the inside line is a difficult trade-off to balance and in truth, individual players who can comfortably play this link-man role are few and far between. At various points on Saturday Cillian, Moran, Dillon and even O’Shea all operated in this area and this is likely to continue to be a floating role going forward, acting more as a pivot to bring the deep runners such as McLoughlin and Higgins into play rather than playing on the half-turn. Considering this, the exclusion of Evan Regan is somewhat understandable. The Stephenites man has done little wrong to date, but arguably without imposing himself enough consistently to demand that starting jersey. Given the style of game that was to be played against Tyrone, Doherty’s industry and tackling prowess between the previously described “blurred” lines of the two 45s became a pre-requisite. With Andy Moran’s ball retention, the need to give clarity to O’Shea by positioning him closer to goal and Cillian as the obvious starting choice as the “strike forward”, then four into three simply won’t go. However, having the option of using Regan’s pace from the bench against tiring defences adds another string to the bow, and as evident from his impressive tally versus Westmeath he undoubtedly will have a key role to play before the season is out. Whether Darragh O’Sé’s blueprint for a successful team is even accurate is open to debate, but it’s nonetheless an interesting model to compare the Green and Red to. Certainly, the likes of Kerry and Dublin would stack up well against it, and perhaps their silverware in recent years proves the hypothesis. From a Mayo perspective, the individual component parts would appear to be there and Saturday’s tactical victory perhaps indicated that the manager is figuring out how to best assemble them. However, as the old adage goes, paper teams win paper cups and there is a further challenge from an exciting Tipperary side looming on the horizon. I can’t wait for the next road test. A few weeks back, over an idle chat in the pub, I was challenged to name my “three favourite things”. Reading that statement back in the cold light of day it seems like a pre-school discussion, but after several pints of the foaming ale it was a topic of considerable gravity. In any event, the final output was boiled down to Bruce Springsteen’s gigs, Elmore Leonard’s novels, and Colm Boyle’s barrelling runs up the pitch. The last entry on that list was cemented when watching the Kildare clash and the aggression and infectious energy he plays the game with. An all-action style that makes the game a joy to watch for even the casual observer. Vital interceptions? Tick. Barnstorming forays up-field? Tick. Teak-tough defending? Obligatory point from range? Last-ditch tackles? Tick, tick and tick. At the moment, I can’t think of a single footballer that is more enjoyable or entertaining to watch. Even in the nadir of the Galway performance, the Davitt’s man tried to lead by example and jolt his team-mates from their collective slumber. That effort was best encapsulate in a two-minute window of the second half where he drove into several tackles, collected a yellow card, landed an audacious point before turning to let out a roar at his comrades to up the ante. Alas on that occasion he was howling in a vacuum, but to borrow a phrase from Chris O’Dowd – Boyler is ‘gangbusters’. After a miserable few Brexit-dominated weeks over this side of the water, with a fairly tepid European championships doing little to lighten the mood or capture media coverage, the qualifier route for Mayo has actually been a blessing in disguise for those of us of a Green and Red persuasion looking for some distraction, and the efforts of our centre back deserve particular commendation. The Second Captains lads recorded a great interview with the legendary Michael Parkinson a few years back (well worth your time here) and one of the particularly brilliant soundbites was his response to the oft-referenced Shankly quote of football (or sport more generally) being more than a matter of life and death. Sir Michael was steadfast in his belief that sport is important exactly because it reminds us there’s something more out there beyond war, or recession or the general travails of the world. And for seventy minutes on two of the past three weekends he’s been exactly right. It was a thought which resonated with me while sitting amongst the electric atmosphere in Castlebar watching Boyle and Co. battle back from a half time deficit against Fermanagh. That an audience can be transfixed by the efforts of amateur players for those seventy minutes probably says as much about the emotional involvement of the average GAA fan as it does for the feats on the pitch. But regardless of the quality of the contest, the honest efforts in competing – the self-discipline, self-motivation and commitment – is always worthy of our respect. Commitment to training, diet, matches, media and sponsors, prize-giving to underage teams and a raft of other behind-the-scenes tasks, while simultaneously managing commitments to family, education and career. All of this honest endeavour to compete is why I recoil when hearing any player labelled a “cheat”, and the treatment of Aidan O’Shea in recent weeks by swathes of the media and in particular by the defeated manager left a particularly sour taste. That he would be vilified in general public discourse in the immediate aftermath of the game was in little doubt. However, to see Pete McGrath still decrying the incident and questioning O’Shea’s integrity almost a full two weeks later was pathetic. In that rancour-laden article, McGrath boldly states that “doing what he did, took away, in an unfair way, whatever chance we had of winning the game”. Let’s take a little recap here for Pete’s sake. Fermanagh kicked two points in the entire second half. Two measly points. Having put themselves in a firm position at half time to go on and win the game, the Erne men had little to blame but themselves for not closing it out. Mayo put in a far better second half performance, were unfortunate to not already have been awarded a penalty and indeed there were question marks over the validity of the Fermanagh goal. But then McGrath has been quick this year to point the finger elsewhere in defeat. After being soundly beaten in the Ulster quarter final, he blamed Donegal’s “gamesmanship”, for the seven point defeat. We’re no strangers ourselves to gamesmanship, but I’ve never felt the tug of a shirt or the wasting of a few minutes defined the winning or losing of a game, and certainly not in breaching five or seven point margins. Would I like to see the various “sledging” and cynicism driven out of the game? Absolutely. But to label any player an outright “cheat” is bordering on slander. In less than a month, global eyes will fall on Rio for the 2016 Olympics. Against a backdrop of political corruption and state-sponsored doping, the world will be expected to suspend belief and accept the improbably credible as true and fair. I know where my definition of cheating lies. These amateur players give us effort and application throughout the Championship summer, and we are absorbed by the contests – both the good and the bad. The players deserve reasoned criticism and fair appraisal not hysterical headlines and personal attacks (as an aside, Senan Connell’s comments on Sky Sports about the O’Shea treatment before the Kildare game were to be applauded). That a senior inter-county manager lit the torches and sharpened the pitch-forks for such a witch-hunt was pitiful. Column inches, airwaves and clicks have been dominated in the past couple of weeks here in the UK by Leicester’s unprecedented march to Premier League glory. And rightly so, the Foxes’ achievement has been nothing short of miraculous. But amidst the hype over Jamie Vardy’s “conference to conqueror” narrative, the magic of Mahrez and N’Golo Kante’s ceaseless engine, the role of the manager has been somewhat overshadowed. Claudio Ranieri was undoubtedly a popular winner. An almost universally liked personality, the plaudits have been forthcoming albeit somewhat tinged with faint praise. “Gentleman” is arguably the most common adjective whenever the genial Italian is referenced. “Winner”, “leader”, “determined” are somewhat lagging behind. But why shouldn’t nice guys finish first? Ranieri’s stock was undoubtedly perceived to be at a low ebb on his return to the UK. The vaguely derogatory “tinkerman” moniker from his time at Chelsea had stuck, despite hindsight now proving he was somewhat of an innovator in the concept of squad rotation. And in any case, his title-winning side from the midlands used one of the lowest number of players in the league. Rather more damningly, he seemed to carry the perception of a losing mentality among the general public, and certainly among the media. While he undoubtedly had some dark days in his previous posting with Greece (defeat to the Faroe Islands a nadir), a career of any longevity will naturally experience peaks and troughs. This was a man who had led Chelsea to second place in the league under pressing circumstances at the dawn of the Abramovich era. This was subsequently followed by runners up spots with Roma, Juventus and Monaco. When losing to fierce rivals Lazio in the Rome derby, he once replaced both club icons Francesco Totti and Daniele de Rossi, and ended up winning. Whatever the uninformed consensus may be about Claudio, two things he most certainly isn’t lacking in is confidence or conviction. As ever, this seemingly wholly unconnected series of sporting events raised similarities with the Green and Red. Thoughts of our own struggles are never far from the mind – “Mayo God Help Us”. 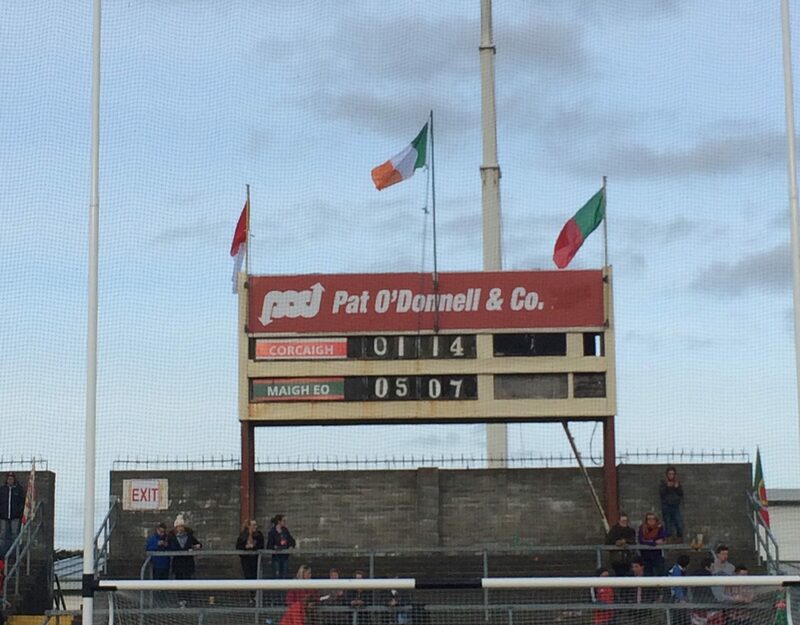 The lack of that elusive Championship title is a blind spot in the public perception of Mayo football. While the roll-call of second bests will forever string a nearly-men tag to Mayo teams that perform on a national stage, the level of sustained competitiveness is so often taken for granted. 5 Connacht titles on the spin. Countless great days out in Croke Park. Heartbreak on the big day undoubtedly, but relentless perseverance and will to improve. This year alone, all three club finalists hailed from the Plains of the Yew Tree. All three vanquished as the naysayers will point out, but to simply navigate the long road from county group to provincial representative and onto Drumcondra in the spring is a phenomenal achievement for any club. For all three to hail from a single county in a single season is exceptional. But all moot. Until that final line is crossed, all other achievements hold a caveat. History is written by the winners. Claudio knew it. We know it too. Which is what ultimately made a glorious day in Ennis a few weeks ago so special. The template was in place for another “almost-but-not-quite” tale, that sinking feeling that all present were familiar with. But with exemplary leadership from Stephen Coen, this under 21 group displayed a truly ruthless streak to claim a title that at many stages of the contest looked like it was out of reach. A trait of true champions. Whether any or all of that squad progress to have successful senior inter-county careers is for another day, and with two underage All-Ireland titles already in several pockets, many of that panel are already in exalted company. Mayo fans are forever associated with “the journey”, but perhaps we got a glimpse of the final destination on that sunny evening in Cusack Park. A journeyman like the wily old Fox at the King Power stadium would no doubt empathise. My grandfather was a gentleman and a great character. A sharp, dry wit, and for someone that never touched a drop of alcohol in his life, was the centre of attention at many a late night music session well into his nineties. He never really held more than a passing interest in football – his passions were cultural rather than sporting – but he was always finely tuned into the fortunes of the green and red. I remember countless league Sunday afternoons, Mayo either featuring either on Mid-West or “Teilifís na Gaeilge” as it then was, when he would stroll in the back door and get settled into the armchair. Never a man to prevent a kettle from being boiled, he’d know the first question to be asked. We could have been playing with a gale force breeze and ought to have been ten or twelve points further ahead. We could have been dicing with relegation due to results elsewhere. We could have been heading for the knock-out rounds. All that was irrelevant. Mayo were up and that was all that mattered. In-depth analysis wasn’t really called for. His enjoyment was in the game itself, not in the wider distractions. For a man that was 20 when Mayo won their first All-Ireland and 35 when they won their last, he could see the bigger picture and the futility of over-analysing the immediate. I’ve thought of him a few times over the past couple of days as the build-up to the semi-final clash gathers pace. The column inches and airwaves already devoted to the game is extraordinary, verging on the bizarre. Whether it’s the unprecedented demand for tickets, Kevin Keane’s disciplinary hearing, Jim Gavin’s nudge and a wink to the referee, various fitness updates or the myriad number of opinion pieces on the key individual battles; the level of media coverage has been more akin to a final. This is all the more astounding considering it is the latter of the two semis, almost as if this weekend’s clash is an afterthought. A Kerry team barely considered at the penultimate stage of the tournament. I’m sure they’re distraught in the Kingdom. Living in London, I wrote previously that all this coverage is meat and drink. A regular dose of championship hype to keep connected with the mood at home. But there’s a problem – I’m struggling to find a regular outlet for this overload of information. Processing such an intake requires two-way communication on a near-daily basis to generate a real championship buzz. And working in a large multinational company, I find myself in a minority of one with an interest in Gaelic games. Water cooler conversations are dominated at the moment by England’s recapture of the Ashes, the start of the premier league campaign, or the approaching rugby world cup. Trying to get views on the merits of Lee Keegan man-marking Diarmuid Connolly is difficult. But nonetheless, I persevere. Allied to the Mayo crest tacked to my desk, I now have an image of Aidan O’Shea barrelling past the Donegal defence as the wallpaper on my desktop. It tends to draw attention whenever a colleague walks past. Know your audience I guess. And so for my own sanity, I’ve decided to take a lead from a wise man and not get too caught up in the analysis or the occasion this time. It’s a losing battle. No doubt I’ll still read everything, and I’ll still obviously be elated if they win, devastated if they lose. But on the whole, my focus will be on taking enjoyment from the day and appreciating what Mayo football means. A unifying factor for local communities, being based abroad it means even more. It’s now a connection with home and a source of community in London instead. And I’m fortunately still close enough to Ireland that these marquee games offer a chance to meet up with friends and family. The morning of the game, the routines of the breakfast, the (proper) pints of Guinness and the chance to yet again visit the hallowed arena of Croke Park. Coaches often speak about players needing to enjoy the big occasions to be able to play to their potential. Maybe there’s a lesson in there somewhere for supporters also. This Mayo side have given us plenty of great days out in the past. I hope they enjoy the next one as much as I intend to. This post first appeared on the ever-excellent http://www.mayogaablog.com, run by the inimitable Willie Joe. Essential reading for all Mayo supporters and fans of GAA in general. Superficial remarks from an experienced referee are a missed opportunity to improve standards, inform supporters and provide greater transparency on the disciplinary process. Back in the heady days of 2007, as the music faded and the realisation was dawning that the party was over, then-Taoiseach Bertie Ahern spent a lot of his time trying to convince people to stay for one more round. His most infamous remark around that time was a critique of those who were beginning to err away from the group-think, the ones he deemed to be “talking down the economy”. It was a crass and flippant remark on an important and sensitive topic but to set aside the seriousness of the issue at hand, what really stood out was the utter stupidity of it all. How could someone in such an important position of influence, take such a dim-witted view and express it in such an ignorant manner? The same instinctive reaction came to mind upon reading Pat McEnaney’s comments from the Mayo v Dublin clash over the weekend. The dismissive tone. That air of “I-know-better-than-you”. The sheer inaccuracy of it all. In the aftermath of Sunday’s contest, Joe McQuillan has been somewhat insulated in the media with a general consensus emerging that it was a nigh-on ungovernable game which he did well to control. Keith Duggan captured the chaos in Monday’s Irish Times describing it as being akin to a zookeeper turning up for work and finding all the cages open. But McQuillan didn’t merely arrive powerless to this scene, he was an active participant in its development. Let’s examine the expert verdict on two key incidents and it’s worth taking a moment here to establish the credentials of that opinion. Pat McEnaney is one of the most experienced referees in the history of Gaelic games, taking charge of All-Ireland finals, International Rules tests and from 2012-2015 was Chairman of the National Referees Committee. His opinion carries weight, and his knowledge should be drawn upon to educate and enlighten the casual observer. In Australia, former referees are regularly employed on TV and radio during AFL matches to comment on incidents. BT Sport have taken a similar route this season in their Premier League coverage where Howard Webb contributes to technical discussions. Dismissive of a rule of the game and somewhat disparaging of the inhabitants of an area of Dublin in the one breath. To accept the antagonist in question did move his head towards an opponent and then reject its validity with a pathetic attempt at humour makes for feeble ‘analysis’. For what it’s worth, my personal opinion is that McMahon shouldn’t face censure for the incident. Having viewed the footage several times and still undecided on the nature of the coming together, I’d rather give the benefit of the doubt where no injury has been sustained. But then again I’m just an average specator – if only there were a knowledgeable commentator to educate me on these technical rules and how the disciplinary process should proceed. Say a former referee for example. Ahem. Jim Gavin has always appeared fairly level-headed and understated in his public utterances. He may rightly have faced criticism for his obtuse stance on a nasty incident in the recent challenge match with Armagh, but there was clearly a larger enforced omerta in place. This calm and reasoned nature was again evident immediately after the game when he was questioned on some of the refereeing calls. “It would be very unfair of me to comment. Joe made the decision based on whatever information he received”. A rational suggestion that the referee makes a decision to the best of his abilities based on information to hand. The excuse of “not that type of player” is one more regularly trotted out by the coterie of ex-players or managers. For someone in McEnaney’s position to even contemplate this as a valid reason behind the decision-making process is concerning. Of all the various flashpoints in Sunday’s clash, Cooper’s was arguably the most serious. It was a deliberate, reckless and cynical attempt to immobilise an opponent and one which could have easily ended Diarmuid O’Connor’s season. The fact that McQuillan awarded a free indicated he had clearly witnessed it, and it’s a poor reflection on his performance that stronger action wasn’t taken. McEnaney’s absolution on such spurious grounds is unhelpful, bordering on irresponsible. These are but two incidents from a footballing maelstrom, where both East and West alike will likely harbour resentment as we head towards the replay. Comments in the media from those such as McEnaney certainly haven’t helped ease the tension or educate the masses. With the disciplinary process yet to run its course there is every reason to expect another powder-keg atmosphere on Saturday. Let’s hope Eddie Kinsella and his team can better control the blast. On Sunday evening in Beijing, the fastest man ever to have lived accelerated to a top speed of 29mph, stretched for the finish line and added yet another sprint title to his illustrious record. In the media gallery, commentator Steve Cram led the cheerleading for the BBC. “Bolt has saved his title! He’s saved his reputation! He may have even saved his sport”. Beside him, Brendan Foster danced a jig of delight crossed with a drunk uncle at a wedding, such was his joy at the momentous occasion. A carnival atmosphere to celebrate Usain Bolt overcoming injury and average form to retain his 100m world title and dismiss the challenge of Justin Gatlin. About an hour later and nearly 7,500 miles away, Kerry and Tyrone took to the field in Croke Park to contest the first of this year’s All Ireland senior football semi-finals. After a cagey first half, a resilient Red Hand challenge was eventually overcome to secure consecutive final appearances for the Munster men. It was a dogged contest in poor conditions with ultimately Kerry’s game-changers from the bench and greater experience seeing them through. And strangely, the reception to this victory bore some similarities to Bolt’s gold medal. In the reviews and analysis that followed, there were two recurring themes to the general discourse. Firstly, that refereeing incompetency influenced the direction of the contest when it was still very much in the balance. Seondly and somewhat more subtly, that if they had triumphed the Ulstermen would have been unworthy or at least unwelcome victors. Both of these should be refuted. Regardless of refereeing errors – and Maurice Deegan made a few – the simple fact of the matter is that Tyrone had numerous opportunities to take the initiative. Ultimately, several spurned goal chances and missed frees at critical times proved their downfall. However, what really resonated was the sanctimonious air with which their elimination from the championship proper was greeted in certain quarters. Tyrone haven’t won too many admirers for their style of play this year, and I’ve previously written about the gap between this side and their recent predecessors. However their approach was effective in the qualifier run and they had reached the semi-final on merit and within the rules of the game as they had been enforced, albeit arguably with very little moral credit among neutrals. Despite these issues, the sense of righteousness about the final result didn’t sit well, as if the purists from the Kingdom had to somehow debase themselves and lower their ethical standards to achieve victory. Vincent Hogan referred to Kerry in Monday’s Independent as the “white knights” of Gaelic football, and lauded them for learning to “play dark” to meet the Tyrone challenge. If that’s true, then there were already plenty of dried blood stains on those shining suits of armour. The biggest compliment that can be paid to Kerry football is they are the masters of evolution in terms of footballing principles. An ability to understand tactical structures which have defeated them and return with it mastered better than the innovators. To meet brawn and brain accordingly as the occasion demands. However, there is an air of romanticism attached to the national view of their football which is almost sacrosanct, as though 37 All-Ireland titles have been secured merely through decades of poetic attacking play and gentlemanly conduct. Kerry are rightly lauded for their footballing tradition, but let’s not elevate them to a higher moral plane because of their success. Whether it’s Páidí O’Sé’s left hook in response to a clip from Dinny Allen, Tadgh Kennelly’s unprovoked poleaxing of Nicholas Murphy, or James O’Donoghue’s penchant for finding the floor in opportune positions, Kerry know what it takes to win. But of course from Beijing to Drumcondra, the common thread here is the overwhelming need for the narrative. Good v Evil. “Light v Dark”. The desire for a saviour to cure all ills. It’s only human to want to enjoy sport for sport’s sake, and set aside wider issues. Witness the championing of Chris Froome and Manny Pacquiao in the past twelve months alone, despite the unsavoury questions to be asked in both their respective codes. But if anyone is to save sport, then it lies with the guardians of the code, not the competitors. Athletes perform to the best of their abilities, but the law and order needed to ensure a level playing field rests with the custodians. Regardless of Bolt’s performance, the fact remains that an unrepentant, twice-convicted drugs cheat was allowed to take to the starting line. Had Gatlin been found guilty of his indiscretions in more recent years, he would likely have been on the receiving end of a lifetime ban. Had he not wilted under pressure from Bolt in the closing ten metres on Sunday, he would likely be world champion today. These are the fine margins of the elite, and the sole saviours are the governing bodies who can enforce and protect the virtues of fairness and equality. No sport is perfect but is still cherished by supporters in spite of the various flaws. The prevalence of doping continues to dog athletics and cycling. A lack of refereeing consistency and transparency in the disciplinary process has drawn as much attention in this past GAA season as the games themselves. Head trauma in American Football and rugby. The integration of indigenous players in Australian Rules. Widespread fraud and corruption in soccer. All can be forgotten by the average supporter, whether it be for 9.8 seconds or 90 minutes. But beyond the fleeting moments of brilliance on the track or field, those issues and more still remain. Sport is human and these are human failings – no trophies or medals can compensate for them. But that doesn’t mean we can’t enjoy the achievements for what they are, and live in those moments of glory or failure. Institutionalised sport always has been and always will be flawed, but that doesn’t make it any less captivating. Overcoming those flaws as best as possible requires concerted and collaborative efforts. To seek individual saviours is to seek the divine. Alas we remain mere mortals. After lifting the Capital One Cup back in March, Jose Mourinho paused to reflect on the achievements of his side in delivering what was his first piece of silverware for two seasons. Special praise was reserved from the special one for what he termed his “new generation of players”, those he had not worked with or won with in his first spell at the club. It was a theme he returned to in May once the premier league had been secured, claiming his double-winning side were “succeeding a fantastic generation”. These are players of undoubted ability like Eden Hazard, Cesc Fabregas and Nemanja Matic – all central to last season’s dual successes, built upon sparkling form in the first half of the season and given a fresh impetus with the Serbian’s arrival around the turn of the year. However, in the closing run from spring onwards the early-season exertions appeared to have taken a toll. Draws with Southampton and Burnley, and narrow victories over Stoke, Hull and QPR all bore signs of fatigue. In particular, players like Fabregas and Oscar who had been so influential in the demolitions of Everton, Swansea (both home and away), and Spurs were now much more subdued and it was broadly left to the defensive resilience of John Terry and creative genius of Eden Hazard to secure results. While an ability to avoid defeat when not at full tilt is generally seen as the mark of champions – and make no mistake that Chelsea were absolutely worthy champions last season – it did raise concerns over how they would start this league campaign with a truncated off-season and a global, gruelling pre-season tour. So what did happen over the summer? While Arsenal have only upgraded their goalkeeping position to date, Manchester United, Manchester City and Liverpool have all invested heavily with further recruits expected before the close of the transfer window. In addition to this, the vastly increased TV revenues are now shared wider among the league than ever before and this has enabled sides further down the table to attract a calibre of player hitherto restricted to the European elite. This new-found competitiveness in the transfer market has resulted in an expanding middle-class, where the arrival of international quality players such as Yohan Cabaye, André Ayew and Xerdan Shaqiri will ensure a stiffer test in encounters beyond the regular top 6. Squad depth will be critical to cope with the challenge. The obvious hallmarks of successful Mourinho sides have been mental fortitude and unity among personnel (on the pitch at least). Central to developing those traits has been a reliance on a small, core group of trusted players. That approach can build close bonds which are conducive to success, but it makes integration of fresh talent or wider squad rotation rather more difficult. Players such as Romelu Lukaku and Kevin de Bruyne are glaring examples of prodigious talents who could not be developed within the confines of the Mourinho structure, and replacing them with players such as Loic Remy and Juan Cuadrado looks foolish at best. To compound that – although beyond Mourinho’s control – it is farcical that a talent like Matic was already on the Stamford Bridge books before being re-signed less than three years after departing for Benfica at enormous cost. Therein lies the rub for Mourinho – reconciling his preferred approach to team development through a small number of experienced, high calibre players (more often than not clients of Jorge Mendes), with a club scouting structure that is built upon large volume intakes of some of the world’s best young talents. With 28 players from Chelsea’s youth and reserve sides spending time on loan this year, its arguable whether this represents a natural step in player development or a means to securing compliance with financial fair play regulations through a “buy ‘em cheap, stack ‘em high” policy. The rumblings in the press thus far have been that Abramovich is focussed on balancing the books to some extent and concentrating investment on stadium redevelopment. With just under two weeks remaining of the transfer window and no established signings currently on the horizon, it may be left to players like Kurt Zouma , Ruben Loftus-Cheek and Bertrand Traore to convince Mourinho the time to really bring through the next generation has arrived. When Pat Spillane first uttered the words “puke football” after Kerry’s defeat to Tyrone in 2003, little did we know the Pandora’s box he had opened. Several of RTÉs regular pundits are no strangers when it comes to throwaway inflammatory remarks, whether its Martin McHugh’s labelling of the Gooch as a “two trick pony” or pretty much anything emitted by Joe Brolly. But with Pat, you got the feeling he genuinely meant it. As though the performance of most of the Ulster counties in that season’s championship had deeply insulted him. The man with 8 Celtic Crosses and 9 All-Stars felt physically nauseous at the sight of these modern custodians of a sport he himself played with such distinction. And nobody drew his ire quite like Mickey Harte’s charges. So it was that an exasperated Pat felt obliged to speak out and in doing so, labelled a group of footballers that would go on to deliver three All-Ireland titles as the purveyors of a toxic brand of football. It’s a moniker that has stuck, and has deepened the siege mentality within Tyrone football since. The passing of the sands of time allow for a certain revisionism. That’s as true for the Kerry teams that Pat graced as it is for the Tyrone sides of the previous decade. History is written by the winners. To label Jim McGuinness’ All-Ireland winning Donegal team as simply a “blanket” did a disservice to the speed of their transitions, their game intelligence and the quality of ball regularly delivered to their danger men in the full-forward line. It may not have been pretty a lot of the time, but it was certainly effective and it’s only when done badly can you truly appreciate how difficult it is to implement. Just witness Kildare’s hapless attempts this season. And only when silverware was delivered were the virtues of that team fully appreciated, and certain flaws overlooked. That hasn’t quite been the case for the first coming of Mickey Harte’s Tyrone. In many ways they laid the groundwork for what McGuinness would further develop. Manic aggression, total commitment, hard-running support lines, spatial awareness, and several lethal forwards who could inflict damage on the scoreboard. Yet that became discounted when an off the cuff remark from Spillane became ingrained in GAA-speak. To the casual observer, it could have served to cheapen the achievements of what was a fine team that worked harder and smarter than any other they met in that 2003 breakthrough season. It’s a soundbite that has lingered, and lesser sides since then from both Tyrone and elsewhere have been grouped under that broad heading as though equals. The phrase “puke football” is indelibly attached to the Red Hand county. Therein lies the real tragedy of that whitewash; that some of the truly great talents of the game almost became tainted by association. There were very few angels in the sides of 2003, 2005 or 2008 and undoubtedly they participated in their fair share of cagey, dour clashes. But players like Stephen O’Neill, Owen Mulligan, Kevin Hughes and Peter Canavan delivered some of the finest exhibitions of all that is good about Gaelic football en route to All-Ireland glory in those seasons. They deserve to be remembered for as much. Now history repeats itself. Here we are at a similar junction with a Mickey Harte side in the latter stages of the championship. Yet again the old clichés are being trotted out and Pat’s phrase gets another airing. But it is farcical to suggest that this current iteration bears any resemblance to the past All-Ireland winning sides. If comparisons are to be made then it’s only fair they’re conducted on a like-for-like basis. The 2003-2008 teams physically played on the line, frequently crossed it, were never short of a word on the pitch or shy about making sure potential frees became definite ones. But allied to that they had skill, flair and could excite when the mood took them or the need arose. 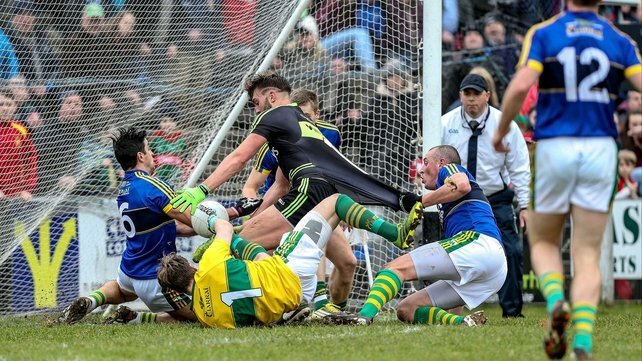 More physical than the Meath sides of the nineties? Hardly. “Cuter” than the Kerry teams of the late 2000’s? Unlikely. So far there’s little evidence to suggest Tyrone version 2.0 bear any resemblance to those title-winning sides in terms of ability, particularly in terms of attacking prowess. After elimination from the Ulster championship by a Donegal side that was there for the taking, a relatively straightforward qualifier run has seen them advance. Central to that progression has been a heavy reliance on a small core of Sean Cavanagh, Peter Harte, Conor McAliskey and Darren McCurry to dig out a result and only two goals have been scored in those five games. Moments of real quality have been lacking – both in terms of football and conduct – with the Monaghan clash undoubtedly the nadir. The diving. The whinging. The cards. The hair. Oh, the hair! Maybe I’m doing a disservice to a team that could yet win an All-Ireland. Maybe they could spring a surprise against Kerry the next day out. Maybe there are qualities yet to come to the surface that could justify comparisons with their predecessors. Or maybe now Pat has reason to feel queasy. Last weekend, the first transatlantic pilgrimage touched down at Knock airport to great fanfare. With a welcome party led by An Taoiseach and witnessed by national media it certainly was a day of great significance for a regional airport that continues to innovate and punch above its weight. Although I should correct myself when I say the plane “touched down”. As anyone that’s landed into Ireland West Airport can testify, that may give an unrealistic impression of what is sometimes a not-so-gentle landing. Not infrequently, adverse winds and fog can mean a tricky approach and getting wheels on terra firma can be rather abrupt. And that’s not actually a bad (if slightly tortured) metaphor for the experience of following the fortunes of Mayo football. Not always blue skies and we can often end up being brought back down to earth with a bump. Not one for travellers of a nervous disposition. Following from overseas can both intensify and dilute that experience. Even in such a technologically-connected world, being one step removed from the day-to-day conversations brings a certain sense of exclusion. Who’s going well at training. The rumoured line-ups. The challenge matches. These are just a few thoughts that might merely be easy discussion topics when bumping into a neighbour at home but they don’t usually crop up in the corner shops of Clapham. And although this may seem insignificant, it adds to the latent sense of occasion that only an extended Mayo run in the championship provides. To compensate for this, I tend to forensically trawl through all coverage of Mayo football online. And if we’re currently spoilt with the quality of the football, then the level of coverage they receive certainly does it justice. Amateur writers such as “An Spailpín Fánach” and Willie Joe of Mayo GAA Blog fame are always compulsive reading. And I use the term amateur in the same sense of the football itself – professional in all but name. We’re also fortunate with the quality of the regional media and the digital supplements of The Western People and The Mayo News are always worth coughing up the few quid for. The Mayo News team in particular deserve extra plaudits for their innovative podcast which has been good company on several tortuous tube journeys. In addition to that local coverage, a few of the national writers seem to have a grá for Mayo football – the ever-excellent Keith Duggan at the Irish Times in particular. All are consumed fanatically. Additionally, any calls home at this time of year invariably involve a five minute maternal briefing on any local or family matters, followed by a forty-five minute in-depth analysis with the old fella on the next championship game. Now that we’re heading for a semi-final, I’ll probably have to up that allowance to an hour. The ties might be slightly remote, but still maintain a tangible connection to the atmosphere. And anyway I shouldn’t complain. London is a great city, and I’m fortunate that it’s still accessible enough to facilitate regular trips home for family, friends…and football. Or more correctly, I’m fortunate that Knock Airport exists to facilitate it. The relationship between the airport and those of us that travel over and back regularly can be summarised by a conversation I heard recently while queuing at Stansted. Two middle-aged Mayo gentlemen ahead of me waiting to board, returning after a week’s work on the building sites of London. I gathered it wasn’t their first tour of duty overseas. Having spent twenty minutes complaining about the cost of the departure charge at the airport, they ended up talking round in circles eventually praising its value compared with the cost of travelling to Britain in the eighties. By the time we were ready to board, a general consensus had been reached that for the convenience of having an international airport on their doorstep, donating all their worldly goods at the gate wouldn’t be outrageous. (For any airport staff reading I’d disagree – a tenner is plenty!) In summary: we shouldn’t take Monsignor Horan’s landmark achievement for granted. And to flog that airport metaphor to death, we similarly shouldn’t take the achievements of this current Mayo team for granted either. For that reason, I had sufficient confidence prior to the Donegal clash to go ahead and book flights back for the semi-final. A gamble on meeting the Dubs in Croker on the last weekend of August. Another flight, another trip to headquarters. This post first appeared on the “Mayo Club 51” site. Club 51 is an excellent independent supporters club for all fans of the green and red. If you want to get involved, check out their website at http://www.mayoclub51.com or join the conversations on facebook or twitter.